Create a case node for each participant and code their interview at the case node—to do this quickly, select all the interviews in list view, right-click and then select Create As > Create As Case Nodes and assign them to the person classification. 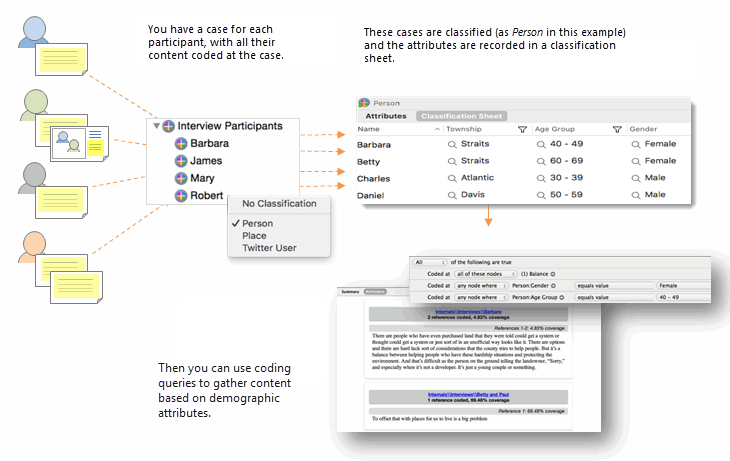 If you are working with a focus group, you can manually create a case node for each participant, then code their content at the case node and set their attribute values in the classification sheet. In a spreadsheet of survey results, demographic data (like age or gender) is usually contained in the rows or columns. Import the survey dataset into NVivo.